The black stains are caused by a cyanobacteria frequently referred to as algae (Gloeocapsa Magma) that feeds on organic material (Typically crushed lime stone) now used in composition roof shingles. Algae growth on roofs occurs to varying degrees in all regions of the country, especially those subjected to warm humid conditions. 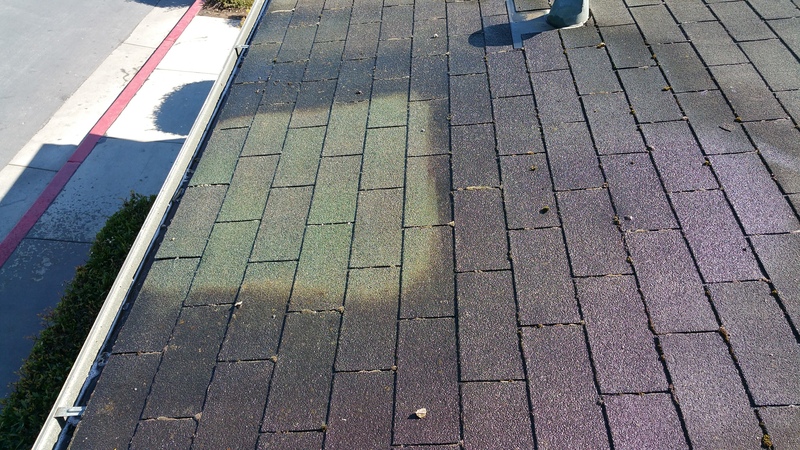 The Sacramento area has a particular problem with dirty roofs due to the consistent marine layer that often covers the coast and certain inland areas. Nearly all types of roofing are susceptible to staining and discoloration. It is, of course, most visible on lighter colored roofs and less visible on darker shades of roofing. Yes. Pressure washing will dislodge the granules from the surface of the shingles and can scar the shingles causing more problems then you started with. Shingle manufacturers make it very clear that no pressure should be used to clean roofs. Although leaving the roof apparently clean looking, pressure washing alone does not kill the algae and the problem quickly returns. Tile roofs are also susceptible to damage from pressure, particularly the glaze finish and color pigment. Yes. We have many happy customers who would love to share their roof cleaning experience with you, please feel free to request a list by e-mail. Yes. We are insured for $1 Million. And we will happily send you a copy of our insurance upon request.